A few days ago, I wrote about seeing “Lion King 3D” and my somewhat weird feelings about Simba. He’s hot. He’s a lion. He makes me giggle. And I hope Nala is good enough for him. Today I am struggling with ordering the hottest leading cartoons from the Disney classics. For parameters, I’m discarding all Pixar-esque or real life films. Although Buzz is fantastic. And JTT’s character in “Tom and Huck” gets an honorable mention. 10. 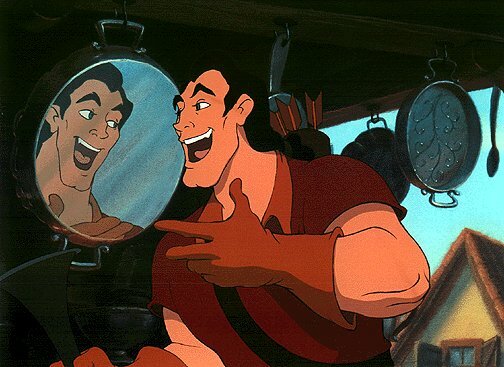 Gaston – Beauty and the Beast. I realize he is enemy number one in this film, but who can deny that every last inch of him covered with hair? He is one beautiful brute of a man. I could totally be one of those ding-dong triplet barmaids that are fawning over him in his big solo scene…. 9. Beast – Beauty and the Beast. I’m putting him in a higher rank than Gaston. He was funny and charming, and had morals, and decided to die for the woman he loved, which is what broke his spell. And he gave Belle a library for a present? That would win me over in a HEARTBEAT. Best scene – when they’re feeding the birds and Belle looks over and he is covered with birdies. But honestly, for me, Beast as beast was such a badass that when he turned into the human, I was disappointed. I loved Beast beyond his hideous outside. And when you got him in a suit and with some training in manners, he wasn’t that bad. I didn’t dig the blonde surfer locks on his human form. He looked like a wimp. Beast as beast all the way. Disregard the fact that he kidnaps Belle. 8. Shang – Mulan. Wow. I would LOVE to “make a man out of you.” heh heh. Again, the shirtless scenes, the moments of raw emotion, the natural born leader, the warrior with the heart of gold. He is haht. You are sassy and I LIKE IT. 7. Dmitri – Anastacia. Technically a Fox film, I believe. But I LOVE this movie. John Cusack, the hottie of all emotional wreck hotties, voices this ragamuffin character who falls for Meg Ryan’s Anastacia. He’s tall, dark, handsome, quick-witted, and a risk. In the end, he turns down the monetary reward he’d been after the whole time? Gives Angela Lansbury the feels? I love it. 6. David – Lilo and Stitch. Is it the cute pidgin he speaks? The way he’s super in love with Lilo’s older sister but keeps fumbling? Or the fact that he’s shirtless the entire film? I don’t know, but its working for me. Also I love that he is constantly and consistently supportive of the struggles in their lives, and never pressures Nani into anything when she says she can’t date at the moment. 5. Simba – I clearly have feelings for him. And possibly some issues to work out. 4. 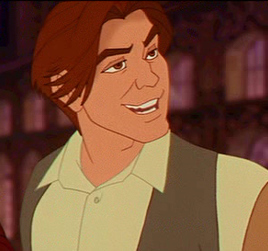 Eric – The Little Mermaid – First, he’s classically handsome. Second, he’s got a really cute dog. Third, he knows how to plan a fantastic first date (horse-drawn carriage, lagoon kayak, Sebastian singing in the background). And Fourth, he plays the flute. Kinda girly, kinda hot. Winner. 3. Aladdin– oh, my sweet ruffian. Why don’t the homeless guys who live around me sport the vest over chiseled chest and abs? He’s also got like a penthouse with the sweetest view ever. Its a little incongruent with his lifestyle. And pet monkeys are nasty. 2. 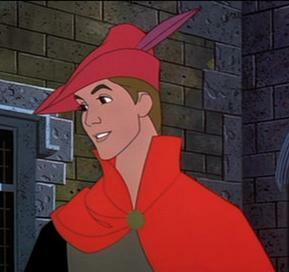 Prince Phillip – Sleeping Beauty. He is dreeeeamy. In every sense of the word. He can ride horses, sing, dance, stab mean dragon witches in the heart. He also follows his heart and stands up to his parents when they are being unreasonable. He is just fantastic. such a flirt! loves it. 1. 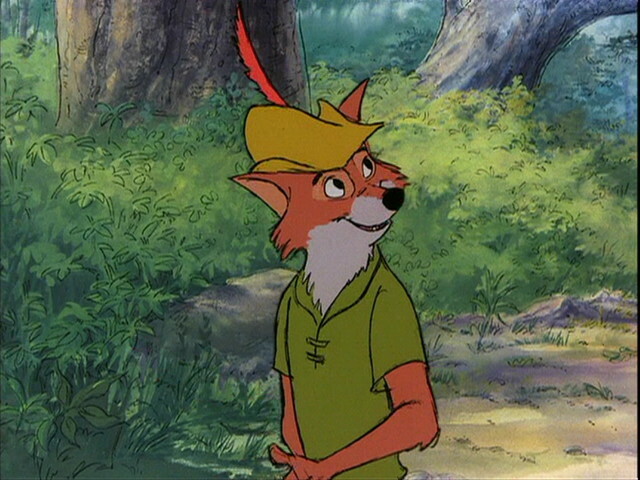 Robin – Robin Hood. Okay. OKAY. I know he is technically a fox, but he is a foxy fox! That accent, robbing the rich to feed the poor, clever costumes (i LOVE costumes!) and a sense of humor and adventure! He plays the violin and has never given up on his childhood love. And he loves camping. We share a lot of the same values. I think it would be a really great relationship. If that sissy Maid Marian would get out of the way. Hercules, Tarzan, Eric (the dad from 101 Dalmations), and I have a weird crush on the tiny mouse in “The Rescuers.” I think because I love Bob Newheart. I respectfully disagree, Aladdin will always be number one in my eyes. He is a diamond in the rough. lol @ Diamond in the rough… that he is! LOL Hilarious and so true. Great Post! Much Respect! He is a hottie. Great first date planner, too. A bit risky putting Gaston in, but I’m pleased he’s last! :P He’s such a meanie but very hot! 170 -Top10- Disney’s Hottest Princesses | danger.danger.danger.